The 2018 Dodge Durango SRT is the first proper high performance SUV from the modern muscle car brand and it arrives as the perfect 3-row vehicle for daily driving – with gobs of power, solid towing capabilities, a premium interior and the kind of handling performance you would expect from an SRT model. 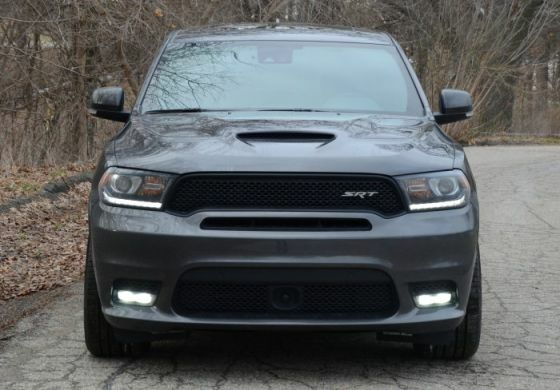 For years, the Jeep Grand Cherokee SRT has been one of the leading performance models in the sport utility vehicle world, but the most powerful Dodge Durango prior to the 2018 model year was the R/T with “only” 360 horsepower. 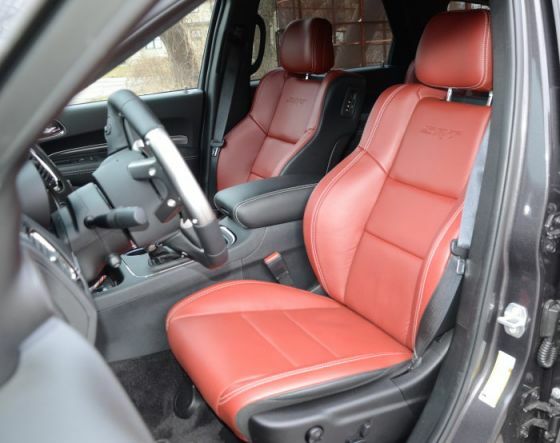 Dodge fans have long asked the company for an SRT Durango rather than buying the Jeep for a variety of reasons, the most significant of which is the fact that the Grand Cherokee only has two rows of seats. The Durango is popular for its added interior space while some people just prefer the look of the Dodge and for the 2018 model year, those demands were addressed. The 2018 Dodge Durango SRT is the vehicle that fans of the brand have been hoping for and I recently had a chance to spend a week behind the wheel of this 475-horsepower SUV. In that week, I learned that the new SRT Durango might just be the perfect 3-row daily driver for someone who wants a vehicle that combines driving excitement, interior comfort and impressive working abilities into one great-looking package. Sure, there are other 3-row SUVs that have a bit more interior space or can tow more or just plain cost less, but when you take into account everything that the SRT Durango does, there is really no competition in today’s market. However, if you are still on the fence about buying the 2018 Durango SRT over one of the competitors, here are five reasons that all combine to make the 475-horsepower Dodge the SUV that you want to drive every day. 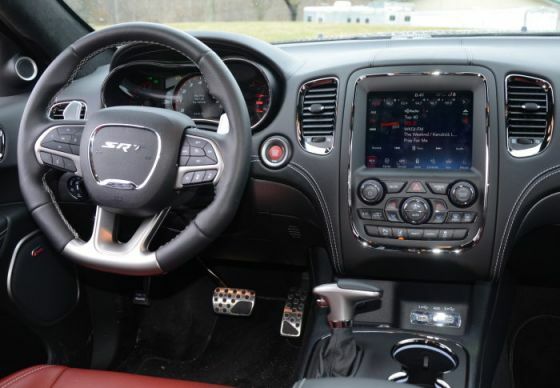 Other than exterior styling, the one place where the Dodge Durango SRT differs from the Jeep Grand Cherokee SRT is in the cabin size, with the Dodge offering three rows of seating and space for up to seven people. More importantly, with the Durango, you can opt for the second row bucket seats, which reduces passenger capacity to just six people, but the second row sport buckets look better and provide far more comfort than the standard seats. However, thanks to the third row of seats, adding the bucket seats still allows the Durango SRT to comfortable carry six people. Truth be told, the third row is a little tight for a taller adult, but for a family of six with four kids – or for someone who has two short friends or coworkers who can ride in the back – this is vehicle offers comfortable seating for six people. Also, like the Grand Cherokee SRT and every other modern SRT product, the Durango has a heavily loaded cabin. 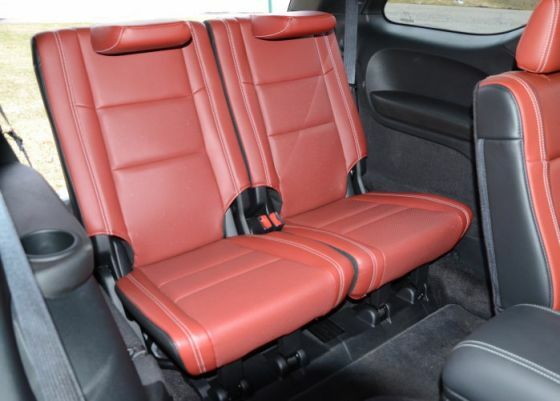 From the gorgeous red leather seats and leather trim throughout the cabin to the award winning UConnect infotainment system with an 8.4-inch touchscreen and a premium Beats speaker system, this sporty SUV has a luxury feel to the roomy cabin. The front seats are heated and cooled, so when coupled with the premium sound system and the state of the art UConnect system, the Durango is the perfect daily driver all year long. Finally, if you don’t need to haul a bunch of people but you do need to haul a bunch of cargo, the cargo area of the Durango SRT is gigantic with the second and third rows of seats folded down. Even with all of the seats upright, there is a solid amount of cargo space, but that area increases dramatically when you fold down each row of seats. There are lots of vehicles sold in the US today with comparable power to the Durango SRT, but most of them are rear-wheel-drive performance cars. If you live anywhere that gets a real winter with freezing temperatures and measurable snowfall, those cars aren’t much fun in the colder months, but the Durango SRT is fun all year long thanks to the advanced all-wheel-drive system. The only downside to the standard AWD system is that you can’t do big, Hemi-powered burnouts, but the upsides are flawless traction on a hard launch in any weather. This provides muscle car-like performance in clear weather and when the snow falls, the AWD system makes getting around a breeze. Of course, this AWD system also makes the Durango SRT surefooted on rough roads and muddy conditions, but I can’t imagine that many owners are going off-roading with their 475hp Dodge SUV. However, if the need arises, the Durango SRT can go anywhere in any conditions, even in heavy snow. 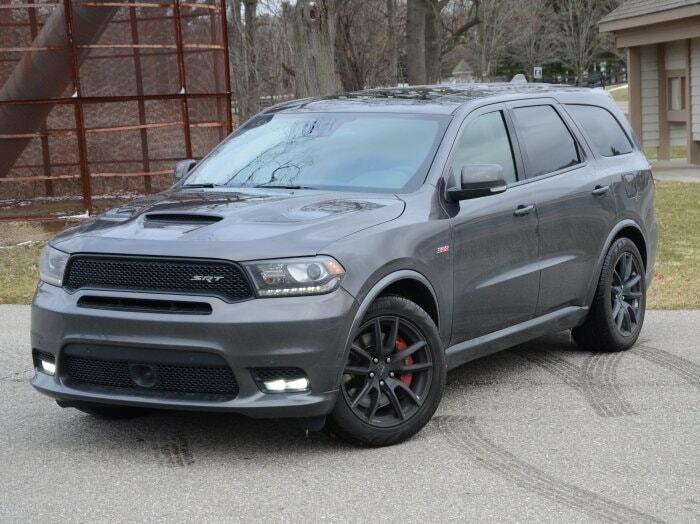 In most cases, a high performance vehicle lacks working abilities, but the SRT Durango is not most vehicles. Even with the 475-horsepower Hemi affording this SUV 12-second quarter mile capabilities, the big hauler can still row 8,700 pounds. That is a higher towing capacity than some larger three-row SUVs with far less power and performance capabilities, so while the Durango SRT offers the performance of a muscle car – it can also tow a muscle car on a trailer. This might be one of those features that many Durango SRT owners will not utilize, but if a situation arises where the 475-horsepower Dodge SUV needs to tow a big, heavy trailer – it will work as hard as most half-ton trucks. The heart of the 2018 Dodge Durango SRT – and what makes it so special – is the 392 cubic inch Hemi tucked under the vented Hellcat-style hood. This 6.4-liter mill sends 475 horsepower and 470 lb-ft of torque towards all four wheels via a quick shifting 8-speed automatic transmission and the aforementioned all-wheel-drive system. This drivetrain allows the Durango SRT to dash from 0-60 in the mid-4-second range while running through the quarter mile in the high 12s. With so many cars on the market that get to 60 in the 3-second range while running the quarter mile in the 10s, it is easy to lose sight of how impressive it is for the Durango SRT to run 12s and hit 60 in the mid-4s. We are talking about a big, heavy SUV that will carry seven people and towing almost 9,000 pounds getting down a drag strip more quickly than some older SRT cars. 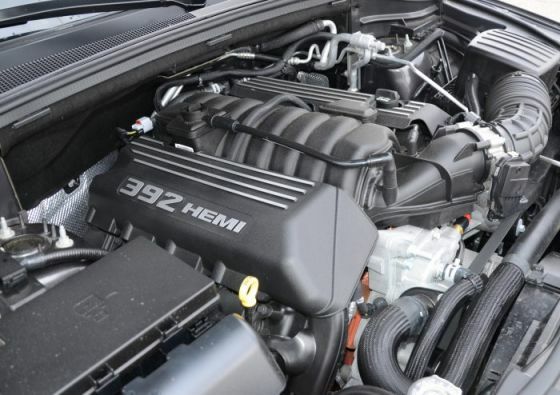 It is crazy quick from a stop, but all of that Hemi power makes the SRT Dodge SUV very strong through the mid-range, comfortably climbing to speeds that most drivers will never experience. Even with a trailer out back, this SUV is quicker and faster than most performance cars sold in the USA. 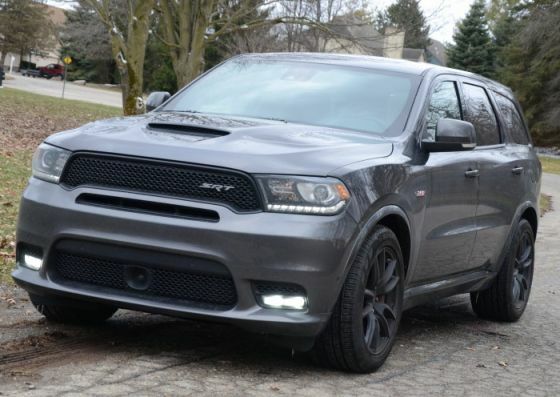 Finally, the most unique aspect of the 2018 Dodge Durango SRT is the fact that it handles remarkably well for a seven passenger SUV. With the SRT adaptive suspension system featuring continuously-adjusting dampers and drive modes with different settings, the Durango sticks to corners like few other SUVs (not counting the similarly-equipped Jeep). The adaptive dampers allow the SRT SUV to offer a smooth ride when cornering capabilities aren’t a key concern, but with a flip of the switch, the dampers stiffen and the big Dodge handles like – well, like an SUV with high tech dampers. 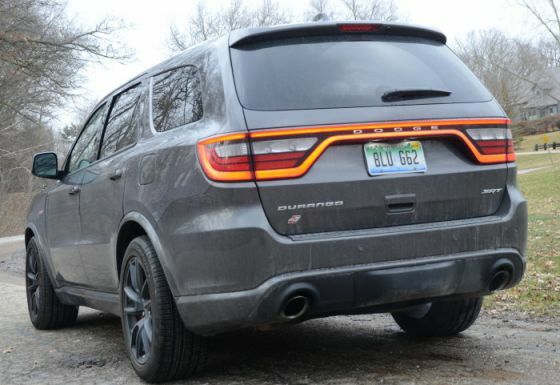 I have had the pleasure of racing around the road course at Indianapolis Motor Speedway in the Durango SRT and it performed remarkably well, so it came as little surprise that the high performance SUV handled my twisty local roads with ease. 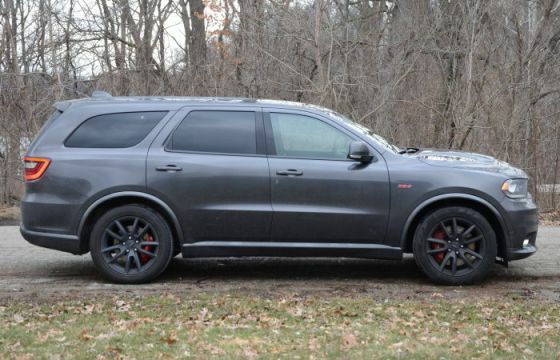 Also, with the gigantic Brembo brake kit, this 475-horsepower SUV stops as well as it accelerates and corners, giving this Durango some of the best driving dynamics in the segment. While the $74,955 price of my 2018 Durango SRT test vehicle is nothing to scoff at, this vehicle combines the driving excitement of a muscle car with the functionality and capabilities of a big SUV, making this one of the most useful high performance machines on sale today.